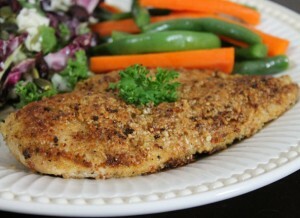 2 lbs boneless, skinless chicken breast cutlets or 8, 3 to 4 oz cutlets. Whisk egg in a glass or small bowl and pour into a shallow glass dish or wide bowl. In another shallow glass dish or wide bowl, mix almond meal with shredded coconut or chopped pistachios (if using) along with sea salt and seasoning of choice. Use a meat mallet to hammer the chicken to an even thickness. Dip the flattened chicken cutlet (or thin slice of chicken) first into the egg on both sides and then into the dry mixture coating well on both sides. Place coconut oil into a frying pan or skillet and heat to medium/low heat. Place the coated chicken into the pan and cook for approximately 3-4 minutes on both sides. Cooking time will depend on the thickness of your chicken. You don’t want to turn them over more than once or you may loose some of the coating. It the crust is golden brown and the chicken is not done in the middle, cook longer on low heat or transfer chicken to a baking sheet and continue baking in an oven at 350F until thoroughly cooked. Serve and squeeze lemon juice on top if desired.